I will put a link to it in my sig. If you had a picture on the old picture page and you would like that same picture to be posted on the new page, then please reply here and let me know. I'm not going to repost any pictures without the consent of the subject. I know that there are many, probably, on the old page who don't even post here anymore. So, if you are on there and you just want to use that picture, then let me know and I'll take care of it. Otherwise, send a new picture to me at the email provided above. Thanks! I must say, Amanaduial knows how to pick surroundings! I'd be grateful if you would copy my picture over from Alk's site as I no longer have the scan that I made. I agree. You've done a great job, Tigerlily! I would appreciate it if you would copy over my same picture from the other site as well. Hookbill gets a star for clever background. Alquadae also gets one for the ship and all. Yeah, I like settings...sue me. 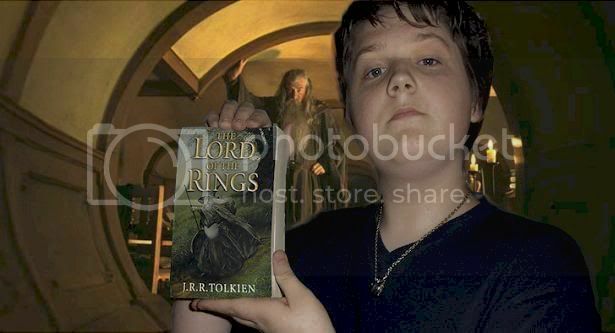 At first I didn't want Gandalf in the background, but he insisted on cameo-ing. But one of them turned out really well. You should always listen to Gandalf. Otherwise, he might turn you into a toad or something else unnatural. Quit talking about other people's pics, Kuru, and send in one of yourself!! Yes, I will practice what I preach and do so myself, but it may take a couple of weeks. I thought I'd wait till I get my LotR costume dress finished and have a picture taken with that. That would be a nice change from the other photo on Alk's page. Anguirel - my my, aren't you saucy? I just found a more recent picture and have sent it to Tigerlily. It’s slightly better quality, plus I’m holding the BEST book in existence! "This is work, not Super-Happy-Fun time!" Visit Memory of Trees's homepage! Why thank you! Thank you very much! A very happy birthday to you, Tigerlily, and congratulations on a job very well done! Yes! I want to see too! Hello everybody its been a while since my picture was added on the old site and I've changed slightly so keep your eyes peeled for my new picture appearing in the next few days. Child, Esty, and Thenamir have come closest to rivalling Gandalf, but Legolas looks a little flat. The biggest surprise was TORE's pic. I never realized that we have an own Smurf here at Downs! Seriously though, his new pic is really nifty! Oh great, I didn't even consider the copyright uh, rights. Oh well, inspired by Fea I couldn't resist messing around a little bit, no one said you had to look exactly like yourself in your pic. Maybe I should pull that out and practice some moves with my sword. Oh, and just as a note, the only reason my pic is funny colored was because it was so blurry that I had to do something to make it look better...it's taken with my camera phone, which can only do so much. Last edited by Durelin; 07-25-2005 at 12:52 PM. Hurrah! I've found a pic of me where I deem I am not unattractive enough to actually send it in! I've emailed it, so all you TGWBS fans (*looks out at the small crowd*) stay tuned! Why, why encourage the fangirls now? I think it was highly questionable and even improper to incorporate Legolas that way with the pictures of those Downers. As if we haven't done enough here at the Downs to hold the barricades against the Legoluvvers. Why, it's enough to inspire me to start a pro-BD fan club and petition! The Truth about Lego is Out There" "Free BarrowDowners from Legolas Identity Theft!" "Stop Abuse and Impersonation Now!" I foresee a glorious future. We shall be the Spittles--Stopping Personality Theft of Legolas Soon. The fangirls will have nothing on us! Of course, we'll need a photoshop pro to help undo all the copies of that picture! I'll talk lestat into helping us! I was okay with eyeliner, but this is a job bigger than I can tackle myself. Oh, and, yes, while I'm posting here, I should say it's great to see those images of Child, Esty and Thenamir. And I love Esty's costume. She is obviously a very accomplished seamstress. I'm just miffed that she didn't sew such a lovely outfit to meet me in last summer. I sent him on a visit to her house a while ago . . . looks like he's made himself quite comfortable. All that traveling and partying and his hair still looks great! What an Elf! Is there a limit to how many pictures can fit on the page? If you're trying to weasel out of showing your face to screaming fangirls, 'Mer, then be assured there is plenty of room for you.